The business world felt a shock on August 9th, 1995, and it was all due to technology. It wasn’t the launch of Windows 95, but instead the IPO of a 16 month old company that gave away its software. The company that raised $2.9 billion in that single day was Netscape, makers of a new kind of software that browsed the Internet. Getting around on the Internet before then was something only universities, the US military, civilian branches of government and very large corporations could do. The exception to this was the World Wide Web, a graphics-based tool which sported images and hyperlinked text. 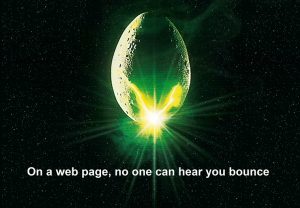 When people with an Internet connection loaded Netscape Navigator on their PCs, they could access an HTML page made available by any other computer on the World Wide Web. As people tried Netscape’s browser, it broadened their impression of what the Internet could be. Browsing soon became THE way for people to use the Internet and its ease of use brought more people to the party. Over the next five years, the universe of Internet users went from 40 million to nearly 400 million. What does all this have to do with sales and marketing? The mass media era was not friendly to the little guy. In the heyday of advertising, many companies vied for a spot on either Print, Radio or TV outlets to reach the masses those three media controlled. Little surprise then, that advertising costs came in only one size – LARGE! This was good for brands who made things everyone needed, but it disadvantaged those making products suited for niche buyers. They had to pay the same to reach their small target audience as the major consumer brands paid to reach their mass audience. They could choose to waste a lot of their advertising spending, akin to going through a whole haystack just to access a single needle. Above all, the pay-to-play model meant that only those companies large enough to pay high costs could play the advertising game. 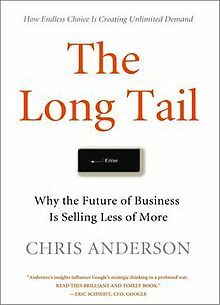 In 2004, Wired magazine’s editor Chris Anderson wrote ‘The Long Tail,” a book whose central theme is that the Internet ended the one-size-fits-all media era, replacing it with a new model. The term stems from the work of Economist Vilfredo Pareto, who noticed that the distribution of any statistical quantity was usually split along an 80/20 curve. That means when numbers are lined up from largest to smallest, there are a few large or high-frequency numbers, followed by many small-frequency numbers that usually “tail off.” The top 20% at the “head” of the line may account for the lion share, but the other 80% in the “tail,” count for something too. When it comes to numbers, 20% of any number, especially the global economy, is a pretty big number! The long tail lets companies serving niche audiences to sidestep mass media. If they have a web presence that speaks the niche language their buyers speak, those buyers can find them. The ease with which they find your website is governed by the keywords and topics that appear on your site. Keywords are the common yardstick used by search engines and other advertising platforms to evaluate whether you are what you claim to be. 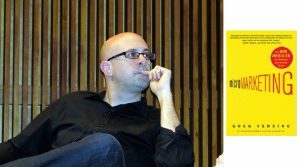 Anderson argues that as the Internet gave everyone access to information, it has suddenly brought the cost of marketing within reach of the 80% of companies that are in “tail” industries. Put more specifically, the web allows products that couldn’t afford offline, budget-bursting marketing programs to get in the game. In Anderson’s opinion, the Long Tail effect makes reaching that needle-in-a-haystack buyer not only possible, but even economical. 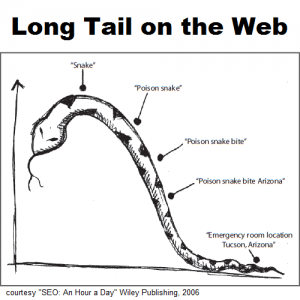 You see the Long Tail principle everywhere on the Internet. Perhaps the company that exemplifies the Long Tail the best is Amazon. You can go to their site, find a niche product, buy it, and Amazon can make profits that wouldn’t be possible with a bricks-and-mortar store. Search marketing platforms like Google AdWords and Bing Ads have built their Pay-Per-Click (PPC) advertising on the Long Tail phenomenon. This is because even companies who want to get in front of a small niche of buyers are willing to pay to reach more of those buyers. No matter where a niche keyword is located on the proverbial tail, as long as two competitors are bidding and there is limited space on a search engine results page, the price can still be pushed higher in the auction. This isn’t all bad. Search engines have built trust because they’ll only show search results from reliable information sources with answers to what they searched for. If we are authorities in our fields and our websites demonstrate that we are knowledgeable and helpful, we will be in a very small pool of competitors for that keyword. 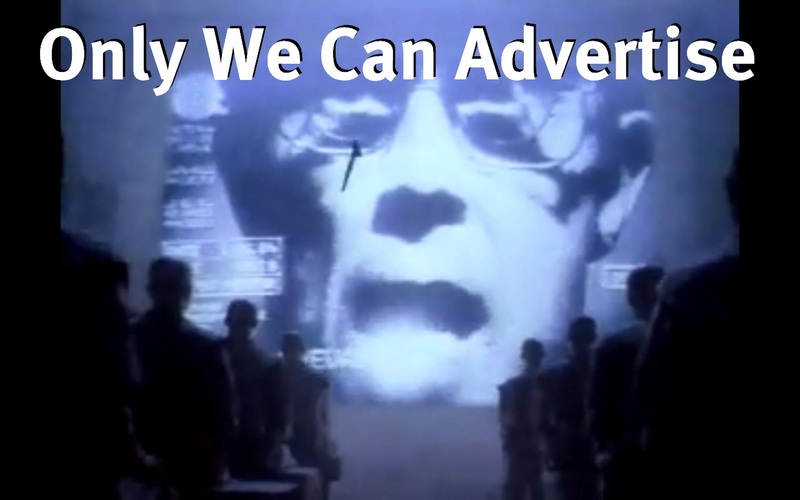 Those with ads claiming to have more authority than they actually have (judging by lack of content on their website) will find themselves barred from bidding on the keyword you are rightfully bidding on. Putting Long Tail content on your site is the best way to get in on these PPC auctions with relatively low competition. The universality of the Internet gives it supremacy over all the marketing channels that came before it. No offline media can match its reach, its cost-efficiency, its interactivity. 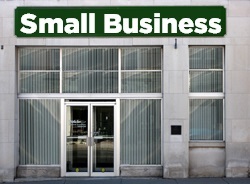 Stop apologizing for the size of the niche market you serve. Revel in the fact that, no matter how small a niche it is, online channels can make it a viable market for you. Lead gen: What Would Deming Have Thought?